I am working on a Masters of Science in Security Studies and my primary focuses have been on terrorism and hybrid warfare. Last winter a professor at my University suggested the IPSI Symposium on Post-Conflict Transitions in Sarajevo, Bosnia and Herzegovina. This came after some discussions regarding whole of government approaches to fighting and recovering from conflicts and wars. As a military member, I have little experience working in this sector. Admittedly, I felt I would be a little bit behind the power curve with other participants who are either studying these problems or currently employed in the sector. I decided to apply and step into the unknown; I knew that I would learn, grow and increase my capacity as a military professional. During this first week, I felt it was easy to participate and that providing a different approach to problem solving and understanding of how the military works was a benefit to the group as a whole and allowed us to look at all of government approaches to these types of problems. While being able to contribute different ideas to other participants, my understanding of world affairs and national use of soft power has increased drastically. I have a much better understanding of now national agencies and NGOs contribute to solving hard problems associated with post-conflict transitions. 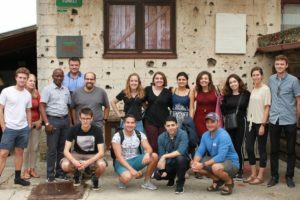 Using Bosnia not only as the location for this course of study but also as the ongoing case study to which our studies parallel adds a deeper level of understanding and implementation. The history lessons and tours conducted as part of the course truly are world class. Now, a week into the program, I am very glad that I took a step into the unknown and was willing to step outside my comfort zone, as a student and professional. This trip thus far has been a tremendous growth experience.